incurred as a result of propeller failure. Introduction: Shipping a prop is really a pain, since typical wood 2-blade props are about 4 feet long and need their own special box: wouldn't it be nice if they were only 2 feet long? 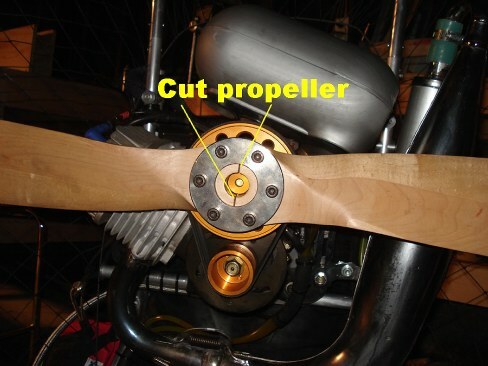 Why not cut one in half… it wouldn't be any different than the 3-blade props out there (except perhaps hub thickness.) I decided to test this idea on an old 47” GSC I had lying around. I can now get my Skybolt paramotor, prop and all, into a box about 26” X 26” X 18” and ship it wherever! the blade thickness was about 1/16”). I then slightly sanded the sides of the cut and laid out the locations of the studs. I placed the studs in the part of the hub that had the most material, as I didn't want to weaken it. I drilled and glued the studs one at a time, so as to get them aligned very closely. I precisely marked the hole locations and slightly overdrilled the hole that the stud was getting glued into. The studs were pieces of ¼” diameter aluminum rod approximately ¾” long. 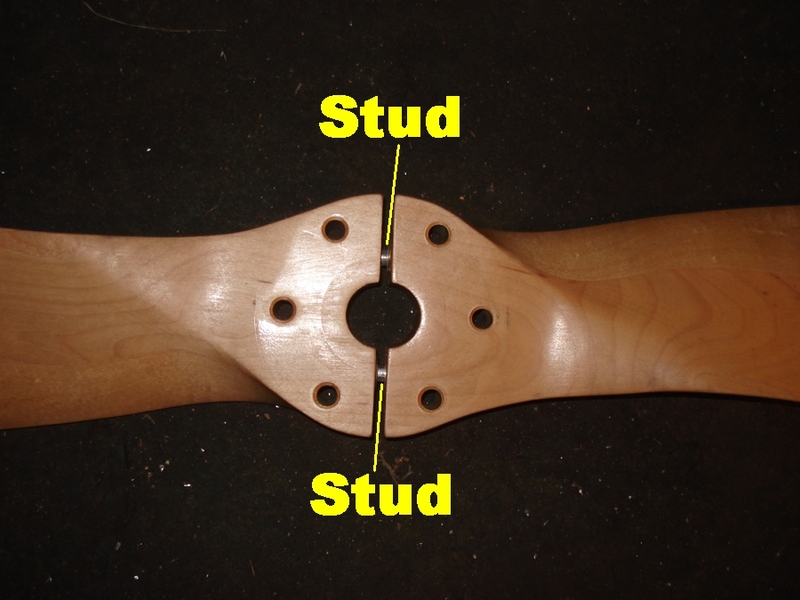 I epoxied the stud into one half of the split prop, and allowed it to fit tightly into the other hole. I got the alignment very close by slightly overdrilling the glue hole and putting the props together, allowing the stud to find its own center while the epoxy set. Additionally, I slid a small brass washer over the stud and glued it in also. That washer is the same thickness as the sawblade, so it preserves the relative spacing between bolt holes. and rebalance it without putting the studs in: I don't know. One advantage to having the studs is that prop can not be put together backwards. For balancing, first I had to buy nuts to go with the prop bolts. 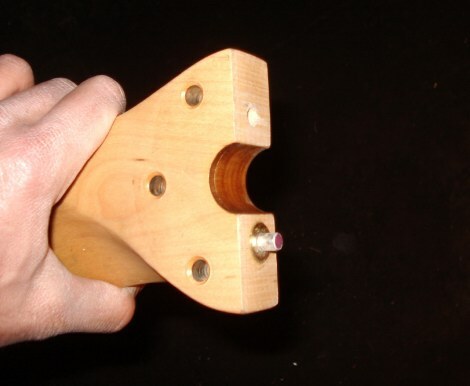 I then used the bolt plate, prop bolts, and nuts to fix the props together for balancing. I had to do surprisingly little work to get it balanced. This prop was tested while I wore a full face motorcycle helmet and hid behind the harness. The test machine was a Skybolt homebuilt with a Black Devil motor. I torqued the prop bolts to 220 in/lbs in a “star” pattern. After mounting the propeller, I ran the machine up slowly 1000 RPMs at a time until it was at full throttle. Then I let the motor go to idle and yanked the throttle, attempting to spin it up as fast as possible. I repeated this 6 times. The propeller was then dismounted and carefully inspected. I have been flying this propeller since I performed the modification. I wanted it to get plenty of airtime before I went public with it. It has about 10 hours of flying on it, about half of those high RPM “carving” type flying, with no signs of failure or weakness. The static thrust of this particular prop was about 135 lbs at 7600 RPM. Again, this is a potentially dangerous modification, and the experimenter assumes all risks. Just because it worked with this propeller doesn't mean that it will work with another.